The observed temperature anomaly of 2006/2007 winter in Japan recorded the highest, tied with that in 1949, since 1899. The 2006/2007 winter (Dec.-Jan.-Feb.) mean temperature in Japan was +1.52°C above normal*, the highest record, tied with that in 1949, since 1899. 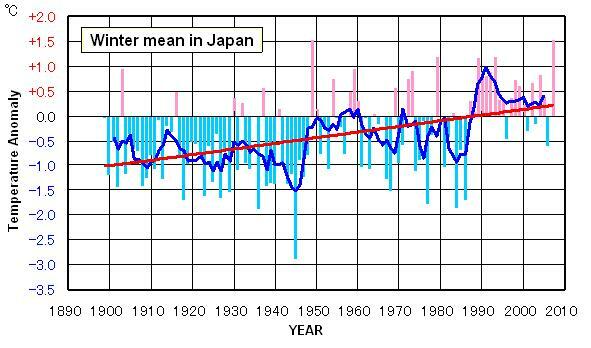 The winter mean temperature in Japan has increased at a rate of 1.14°C per 100 years (Figure 1). The monthly mean temperature anomalies in Japan during this winter were +0.78°C in December (rank 17th), +1.44°C in January (rank fourth) and +2.35°C in February (rank third). This extremely warm winter in 2006/2007 is thought partly influenced by the global warming due to the increase of greeen-house gasses, such as CO2. However, the primary factors are thought to be a combination of two siuations; 1) the planetary scale flow pattern, which prevented southward outflow of cold air from the arctic region, prevailed mainly in the first half of this winter, and 2) the eastward shift of the location of the Aleutian Low, which was unfavourable for strong west-east surface pressure gradient and for cold air surges around Japan. The latter situation was often observed during the El Niño winters. * Base period for the normal is 1971-2000. The Japan mean temperature is calculated from the surface observations at the 17 observatories where there are long-term continual observation data and less urbanization effect.